NetherRealm Studios held their latest Kombat Kast today, where they broke down Noob Saibot, Erron Black, and newly leaked character, The Kollector‘s abilities in Mortal Kombat 11. As usual, Tyler Lansdown, Community Manager at NetherRealm Studios, was joined by fellow NetherRealm employees Steve Brownback, Senior QA Analyst, and Derek Kirtzic, Senior Systems Designer on Mortal Kombat 11. Tyler stated that the character variations that were present in the Beta are not the final variations that will appear at launch, and that there will be specific Tournament variations for competitive play. 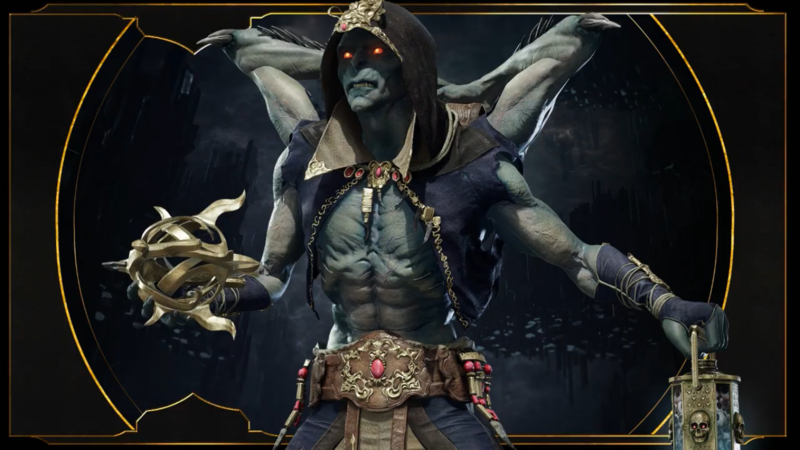 They then showed off a new trailer to officially reveal The Kollector before getting into the loadouts for each of the Kombat Kast’s characters. Anti-Air Mace: The Kollector throws out a mace on a chain that hits his opponent out of the air. Command Grab: The Kollector will grab his opponent and stab them multiple times, then throw them in the direction of your choosing. Teleport: The Kollector will teleport behind his opponent. This move is very fast, and can be used to escape zoning characters or to set up a combo. Fire Projectile: The Kollector throws a projectile that lights his opponent on fire, dealing damage over time. Chakram: The Kollector throws a disk projectile, embedding it into his opponent. It can be amplified to stun an opponent, leaving them open to a combo starter. If an opponent is already on fire, the Chakram will trigger a Krushing Blow. Low Slide: Noob Saibot slides across the floor kicking his opponent. Similar to Sub-Zero’s slide. Dive Kick Clone: Noob Saibot’s clone dive kicks his opponent from the air. Ghost Ball: Noob Saibot launches a projectile that drains his opponent’s stamina. Sickle Snag: Noob Saibot hits his opponent with a string of attacks. It can be amplified to juggle the opponent, and can also be used as an anti-air or to extend combos. Sickle Overhead: Noob Saibot throws his Sickle in the air, then his clone teleports to the sickle, catches it and drops down on his opponent’s head. Sickle Teleport: Noob Saibot throws his sickle, and teleports to wherever it lands. Command Grab: Erron Black grabs his opponent, throws them to the ground and shoots them multiple times with his revolver. This move can also be amplified to add in a dynamite throw at the end. Low Shot: Erron Black ricochets a bullet off of the ground into his opponent, causing them to fall to the ground. This move is good for keeping opponents at bay. NetherBeast Trap: Erron Black places a trap on the ground that will ensnare an opponent’s leg. It can be amplified to turn it into a projectile, causing Erron Black to kick the trap across the floor toward his opponent. Skud Shot: Erron Black will shoot an opponents projectile out of the air, cancelling an opponents attempt at zoning. What did you think of The Kollector’s reveal in today’s Kombat Kast? Let us know in the comments below!